Occupation: I copyedit a bi-weekly art e-journal, "...might be good" . I also run a fun side blog about Austin, Texas with my friend, but that doesn't really bring in money , and I pick up technical writing gigs whenever I'm dead broke, which is often. What else? (I work a lot.) Oh, I just finished organizing this poetry conference for Latinas and I write book reviews for The Rumpus . I'm also going to start being a teacher's assistant at my university pretty soon. 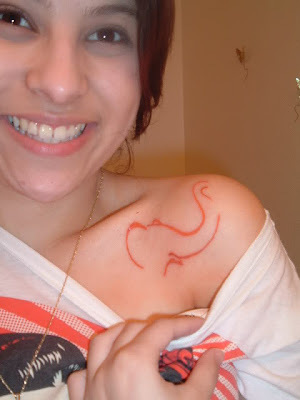 Age of first tattoo: 18, my 18th birthday. I probably would have waited a few more days to get the exact same tattoo-- something I'd always wanted-- but I was angry at my dad for some reason, and I thought a tattoo was the perfect way to get revenge. (I was young and dumb.) Somehow the anger gave me the balls to go through with it. It was a small tattoo of a Scorpion on my right foot because, you guessed it, I'm a Scorpio. I am the definition of a Scorpio. 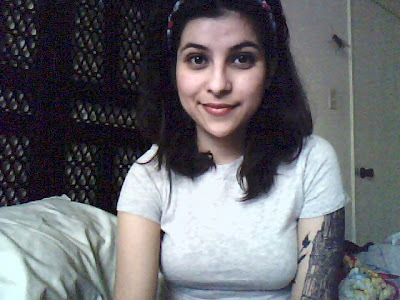 Favorite tattoo: I honestly never even think of my tattoos after they're on my skin. I love each one, but there's no way I could think of which one would be my favorite. I've tried choosing, but I can't. Featured tattoo/location: A woman holding a bird with two pairs of birds flying away, and it's on the inside of my left arm. Artist/shop of featured tattoo: All of my tattoos have been done by Lupio at Blindside Tattoos in Austin, Texas. First I thought I wanted to get a tattoo of a flock of birds. This is around the time I was reading and re-reading "Extremely Loud and Incredibly Close" by Jonathan Safran Foer, and there was a passage in the story where an old man hears the flutter of wings again for the first time in a long time. I cried when I read it. There was something so infinite and passionate about it. To me, that passage and the flock of birds represented a new beginning, a love of beauty, a love of the little things in life, as well as a little something about the continuation of life, about migrating and moving. I eventually decided a flock of birds was too American Eagle for me. Somehow I decided to incorporate my mom into the tattoo-- my mom's the lady-- and it became about moving on in life, but forever remaining with love. On the back of my left arm is an anchor with the word "without" running across a scroll on it, it's of a print work by my dear friend and artist, Cassandra Warren. To me, this tattoo is about not having a home, not calling any one place home. It's also a little bit about heart break. When I saw the print Cassandra had made of the anchor, I knew instantly that I needed it on my skin. It spoke to me. I love it a lot, but I'm always bummed when I realize it's difficult for me to see. 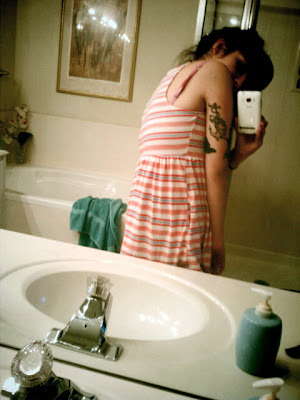 I love being able to look at my tattoos whenever I want, and this one is tricky for me. 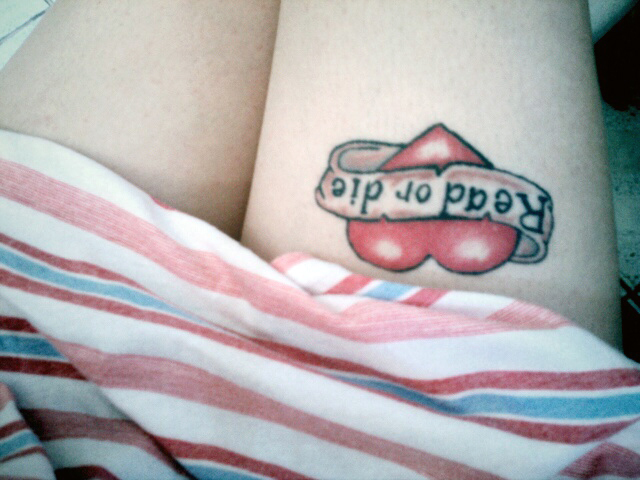 Unfortunately, this is the tattoo I forget I have the most often. On my shoulder, I have an outline of an elephant in orange. My best-friend from high school and I got matching tattoos. 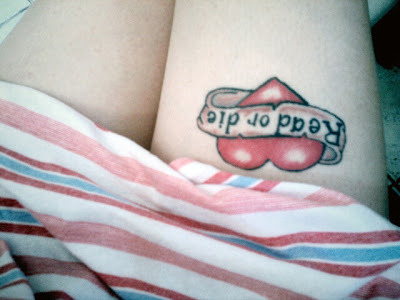 I think it's a cute and fun tattoo. I love that it's all in orange, and that most people don't think it's real or realize I have it. 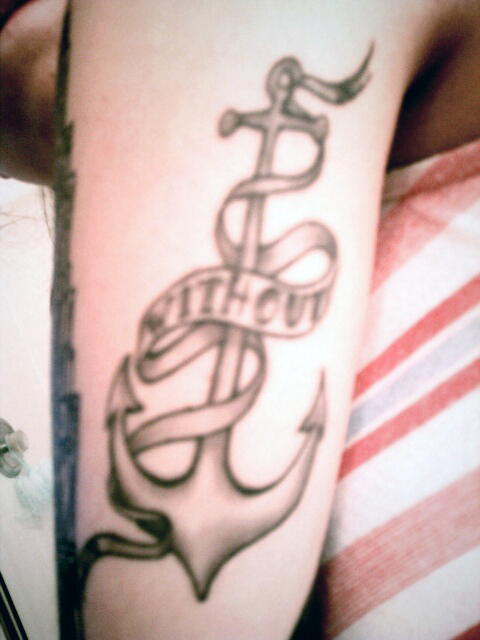 However, about a month after getting this tattoo with my friend, we completely lost contact with each other. Nothing went wrong.. We didn't grow apart or anything. We just separated. I blame the tattoo. 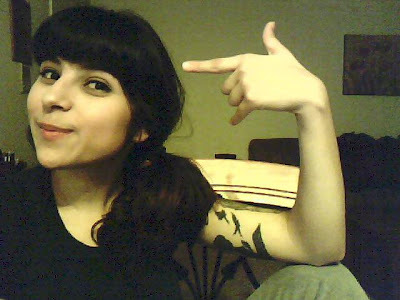 I also have a sailor-esque tattoo on my right thigh that says "read or die." It's my only joke tattoo. I got the idea from a pseudo-tattoo that was being sold in a toy store. When I told my tattoo artist I wanted it, he kept drawing really elaborate hearts and scrolls with really fancy fonts-- all of them beautiful. It took some serious convincing for him to give me a rough, quick-looking tattoo. I figured, since it's a joke, I didn't really want anyone to look at a beautiful tattoo and think I was serious about what it says. Yes, I support reading, but there's no way that if you don't read you'll die. The logic of the tattoo is warped. Plus, it's the opposite of tough, but still tough. I do want more! Only two or three more, but I need to stew on what I'd get and what it would look like a bit more. I don't want to jump in to anything. I'm pretty set on getting some word or phrase in the Goosebumps font and I'm also pretty set on getting something on my left thigh, but those are all the specifics I have right now. All of my friends are fine tattoos and have tattoos as well. I live in Austin, Texas. Even our doctors and professors have tattoos. It's no big deal. If I'm in another city-- or worse, another country!-- then I get side-eyed and rude comments about how I'd be prettier without tattoos, but it's always the typical stuff, and it doesn't bother me. I've never had a work problem with my tattoos or anything. I usually try to hide them until it slips beneath a sleeve or something, and then everyone in the office finds out, and I'm told to not hide my tattoos. My parents, however, are from ol'-timey Mexico. I knew they'd be upset that I had tattoos, so I didn't tell them for two years. I just hid them all the time. (It was easier to do than I thought.) I finally told my mom because I was going to wear a strapless dress at a family wedding and she was going to see it. It broke her heart. She was heavily depressed for at least a month. She thought she failed at raising me. She wouldn't look at me. She said she had no reason left to live since she failed me so badly. There was no talking her out of it. She still winces when she sees any of my tattoos and asks me to cover them up. I never told my dad I had tattoos. Once my mom knew, I stopped trying to hide them. About a year after I stopped hiding them-- and my mom didn't tell him anything because if I was going to get in trouble, then I deserved it-- my dad asked what I had on the inside of my arm and if it was a bruise. I showed him. He looked at it. Didn't say anything. Frowned. Later, this is when I had half inch plugs, he asked me when I got plugs; I told him I'd had them since I was fourteen. He couldn't believe it. (I was twenty at this point.) He was shocked. Then, he didn't say anything about the plugs, but he said, "I don't like your tattoos." And that was it. 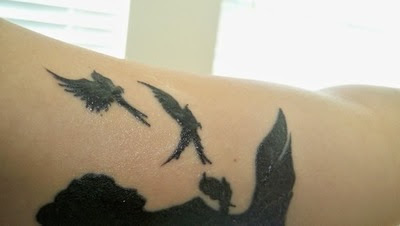 I ADORE the birds and woman tattoo. So beautiful. I love the block sillouette. She has a good point. 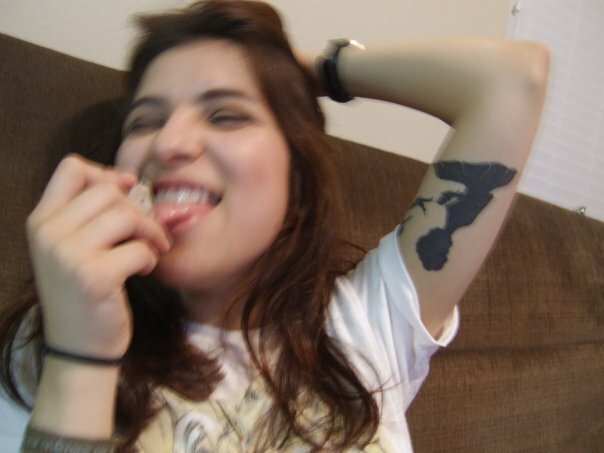 I got a less than beautiful tattoo at 16 in a NYC basement. Now I think it is funny, but for a while I was mortified. love 'em, especially the elephant. i wish i was brave enough to get one, but i always talk myself out of it. 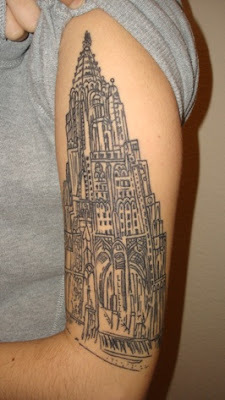 Love the detail in the cathedral and the heart tattoo is really cool(even though it was a "joke" tattoo). Nice work. i can't believe you were able to hide them for two whole years! very pretty though- all of it.